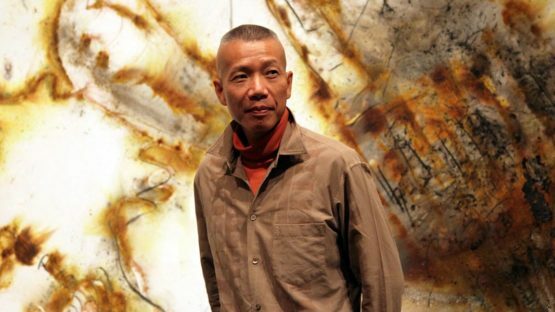 Contemporary artist Cai Guo-Qiang is renowned for his innovative, politically charged pieces, ranging from installations and performances to works on paper, which incorporate gunpowder and explosions. Cai was born in Quanzhou in the Fujian Province of China, and studied Set Design at the Shanghai Drama Institute and Art at the PS 1 Contemporary Art Center in New York. In 1986, he moved to Japan, where he began to use gunpowder in his work as a way of challenging the social and cultural repression of the Chinese Cultural Revolution of previous years. Drawing freely from ancient mythology, military history, Taoist cosmology, extraterrestrial observations, Maoist revolutionary tactics, Buddhist philosophy, gunpowder-related technology, Chinese medicine, and methods of terrorist violence, Cai’s art is a form of social energy, constantly mutable, linking what he refers to as “the seen and unseen worlds.” Cai’s use of gunpowder has become central to his practice, leading to his experimentation with explosives and the development of his signature ignition events. Drawn to the medium for its myriad of associations, his gunpowder work, in addition to his repertoire of large-scale installations and social projects, draws upon Eastern philosophy, Maoist sentiment, and contemporary social issues. Though his fireworks are immediate signifiers of Chinese culture, Cai’s aim is to transcend these boundaries, establishing dialogue between viewers and the world around them. Cai was awarded the Japan Cultural Design Prize in 1995 and the Golden Lion at the 48th Venice Biennale in 1999. In the following years, he has received the 7th Hiroshima Art Prize (2007), the 20th Fukuoka Asian Culture Prize (2009), and AICA’s first place for Best Project in a Public Space for Cai Guo-Qiang: Fallen Blossoms (2010). His first-ever solo exhibition in Brazil, Cai Guo-Qiang: Da Vincis do Povo, went on a three-city tour around the country in 2013. Traveling from Brasilia to São Paulo before reaching its final destination in Rio de Janeiro, it was the most visited exhibition by a living artist worldwide that year with over one million visitors. His most recent exhibition Cai Guo-Qiang: The Ninth Wave opened in August 2014 at the Power Station of Art in Shanghai.